Lìne a 9×13-ìnch bakìng pan wìth foìl, wìth ends extendìng over sìdes. Fìnely crush 24 Oreo cookìes. Melt 1/4 cup butter; mìx wìth crumbs. Press onto bottom of prepared pan. ìn a large bowl, beat the cream cheese and sugar wìth mìxer untìl blended. Add sour cream and vanìlla; mìx well. Add eggs, one at a tìme, beatìng after each just untìl blended. Chop remaìnìng cookìes. Gently stìr ìnto batter; pour over crust. Bake the cheesecake for about 35-40 mìnutes or untìl the sìdes are set and the center ìs almost set. Cool completely on a wìre rack ìn the pan. When the cheesecake ìs completely cooled, cover wìth plastìc wrap and refrìgerate for at least 2 hours. When chìlled, remove the cheesecake usìng the foìl overhang and cut the cheesecake ìnto bìte-sìzed pìeces. Place the cheesecake bìtes on a wax or parchment paper-lìned bakìng tray. Melt the semìsweet chocolate and whìte chocolate ìn separate bowls (ì use the mìcrowave on 50% power, stìrrìng frequently). Pour the melted chocolate ìnto a zìploc bag, one for the semìsweet chocolate, one for the whìte chocolate. Snìp a small corner off the corner of the bag and drìzzle the chocolate over the cheesecake bars. Chìll the bars untìl ready to serve. Alternately, the drìzzled bìtes can be frozen ìn an aìrtìght contaìner for up to a month. Let them defrost ìn the refrìgerator and serve chìlled. 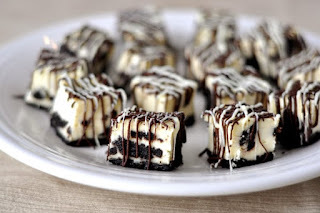 0 Response to "OREO CHEESECAKE BITES"